Like any large piece of equipment, your heating and cooling system requires regular maintenance to keep it running at its peak efficiency. You wouldn't dream of skipping required maintenance on your car for fear of the likelihood you would wind up stranded on the side of the road. However, many people skip annual maintenance on their heating and cooling systems because they mistakenly assume it is too expensive and not needed. Skipping annual maintenance can lead to the additional costs of unnecessary repairs and early replacement fees, as well as higher utility bills year round. In reality, a furnace or air conditioning tune-up will pay for itself in lower utility bills and repair costs. Many companies now offer maintenance plans that make caring for your system even more affordable. Put your system on a yearly schedule and spread the cost of maintaining it out over the course of the year. During a typical tune-up, a professional technician will complete a comprehensive checklist to make sure your system is functioning properly. Your technician should also provide you with a list of recommendations of actions to take to remedy any current or potential issues. 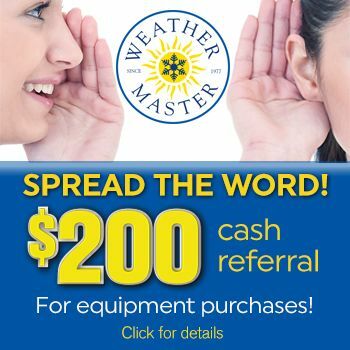 At Weathermaster, we perform an 18 Step Precision Tune-ups with professional cleanings in about an hour. Schedule yours today.